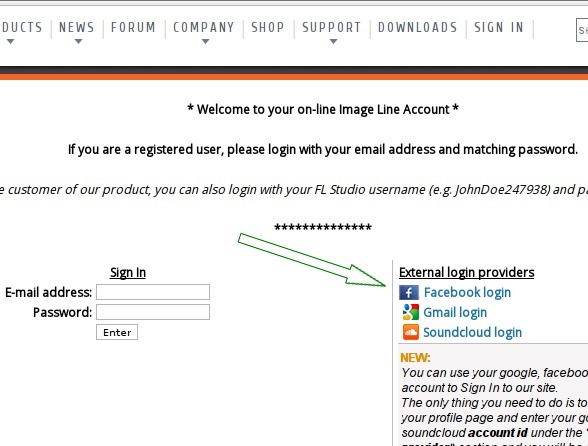 You can use your Google, Facebook or Soundcloud account to sign In to our site. 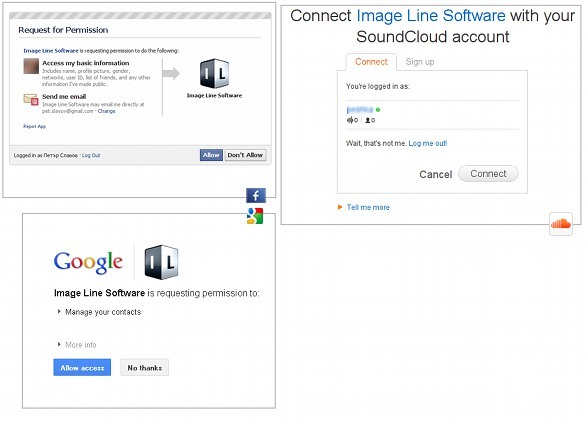 The only thing you need to do is to sign in normally to your Image-Line account page and enter your Google, Facebook or Soundcloud account id under the "External sign in provider" section and you will be able to sign in to our sites just by clicking on one of the links in the sign in page. If you are already signed in to Google, Facebook or Soundcloud you will only be prompted to allow access to your public information. You can also use your Google Apps account id for your Google id, even if it is not @gmail.com. The advantage of this system is that you don't have to remember a lot of different usernames and passwords for every different site. You can just use your Google, Facebook or Soundcloud account, that you use very often. That is why a lot of sites have already implemented this sign in system. First sign in normally to your Image-Line account, go to your profile page, and enter your external sign in provider account id in the "External sign in provider" section. Then you have to click the "Save" button to save the information. Now to test the external sign in you can sign out from our site and use one of the external sign in links in the sign in page. 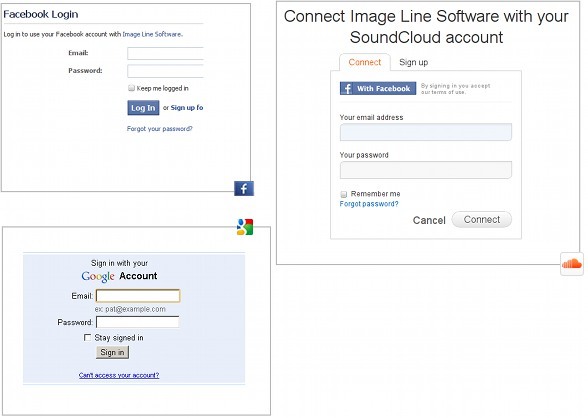 When you click on a link you will go to the external sign in provider (Google, Facebook or Soundcloud) authentication page and you will be asked to enter your sign in credentials to sign in to their system. To be sure where you send your private information, always look at the site url in the browser address bar when you get the username/password box (for gmail it have to be ...google.com, for Facebook - ..facebook.com, for Soundcloud - soundcloud.com, etc.). After you sign in to the external sign in provider site, you will be asked to confirm that you allow our site to access your account id information. This is needed to compare it with the information you entered in the "External sign in provider" section. After you confirm you will be signed in our site with your account.